Siniša Mesjak is an ambitious politician who gets involved into scandal. In order to keep him away from the public eye, the Prime Minister sends him to Trećić, an isolated Croatian island with no telephone or internet signal, and which inhabitants speak with the dialect that he does not understand. There, he is in charge for organising local elections – a task that seven commissioners before him failed to accomplish. Ivan Salaj was born in 1969 in Zagreb. He is screenplay writer and director. He is the author of ‘See You’ (1995), a mid-length film, awarded at the Film fest Cottbus, documentary films ‘Second Floor, Basement’ (1991) and ‘Hotel Sunja’ (1992), as well as ‘Resistance Day’, which was part of the feature anthology Zagreb Stories Vol. 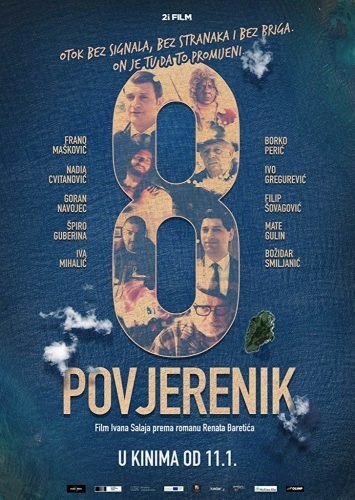 3 (2015). He worked as director, screenwriter and script-doctor on Croatian Radio television and RTL, and has directed around 60 commercials. ‘The Eighth Commissioner’ is his first feature.